Living Life Artfully features my artwork, ideas, inspiration, and humor. If this newsletter was forwarded to you, subscribe here. Newsletter subscribers receive free shipping on website orders up to $500. In the past few months, I’ve had three collectors purchase my paintings with the intention of hanging them somewhere in their homes. 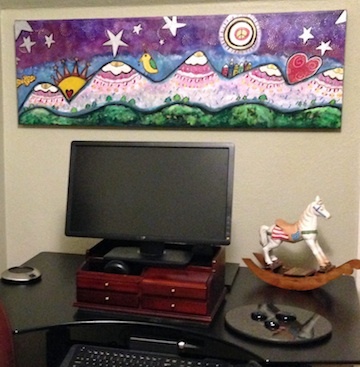 Surprisingly, all three chose to hang their art in their offices; Bill displayed his painting in the entryway of his home office, Andrea placed her custom commission in her cozy home office (left) and Kathy, encouraged by her supervisor, brought her painting to work for a daily dose of inspiration. Smart manager! Employees surrounded by beauty and art will likely remain motivated and productive workers. If you are sitting in a dreary office devoid of art, or worse, uninspired art, you have the power to make a simple change. Infuse your work space with meaningful decor. It doesn’t have to be expensive, either. Just one canvas or framed print can do the trick. No wall space? No problem. Try desktop art. Choose an original painting or limited edition print from your favorite artist’s collection or have the artist create something special, just for you. You spend a lot of time at work. Having art that inspires you can positively impact your day while nourishing your soul. My collectors think so. Excited by the idea of transforming your workspace? I’d love to help you. 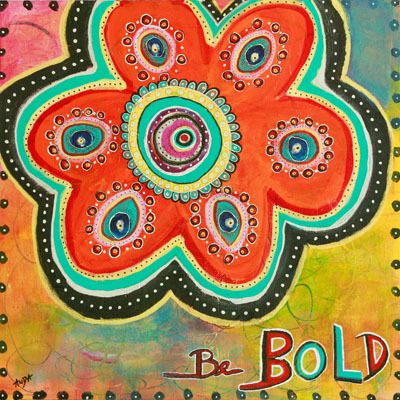 Recently Sold -- "Be Bold"
Don't be small, be large. Don't hide who you are, show the world your many colors. Be proud of who you are. And share it with everyone." Devon Fine Jewelry, Wyckoff, NJ - coming this spring!